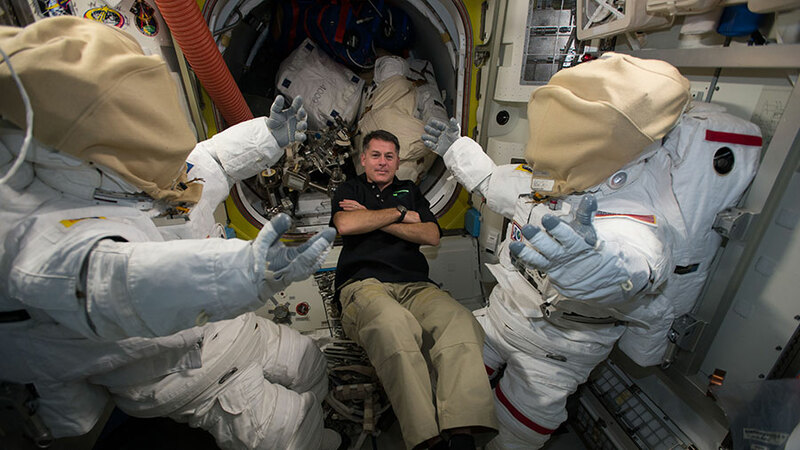 Commander Shane Kimbrough rests in between a pair of U.S. spacesuits inside the Quest airlock. Two first-time space flyers, Sergey Ryzhikov from Russia and Thomas Pesquet from France, partnered again today for the Sarcolab muscle study. The duo used an ultrasound scanner and electrodes to measure and stimulate the knee muscles for possible muscle loss due to microgravity. Commander Shane Kimbrough and NASA astronaut Peggy Whitson continued more maintenance work on the Electrostatic Levitation Furnace, a combustion research device that enables high temperature science. Whitson then worked on the Packed Bed Reactor Experiment gear that observes the behavior of gases and liquids. Whitson and Pesquet later joined their Soyuz crewmate Oleg Novitskiy for a medical emergency drill. The three Expedition 50-51 crew members reviewed CPR procedures, medical hardware and their roles and responsibilities.